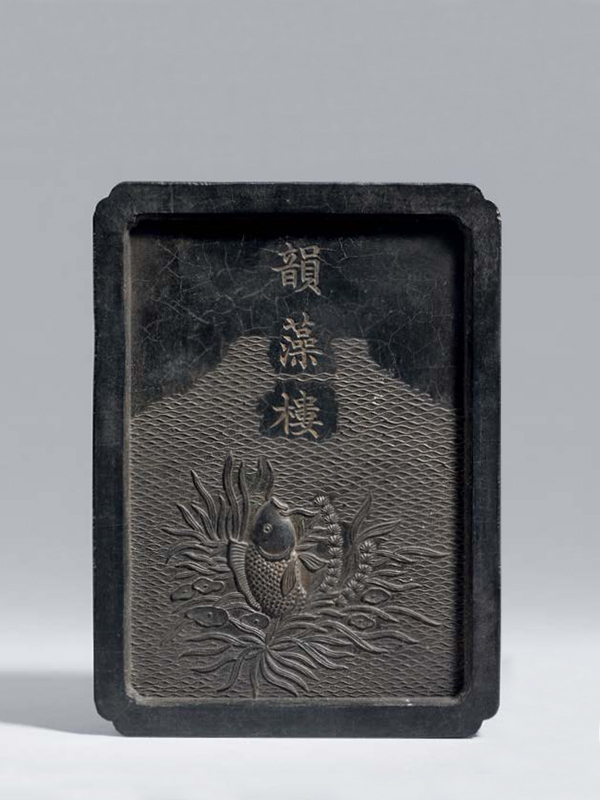 A rectangular ink tablet with a building in a landscape on one side and a carp on the reverse. The reverse bears the three-character inscription Yun Zao Lou and depicts a carp jumping up from algae in a wavy pond. The other side is moulded with a landscape scene, in which a partially-gilded, two-layered building is supported by a bridge and protrudes in a river, with overlapping mountains as the background. The long sides of the ink tablet are symmetrically moulded with two six-character inscriptions, respectively reading Da Qing Qianlong Nian Zhao (Made in the Qianlong reign of the Qing dynasty) and Xiu Cheng Hu Kai Wei Zhi (Made by Hu Kai Wen at Xiu Cheng). Tang dynasty (618 – 906) and became a minor art form for the collector especially during the Ming and Qing dynasties. 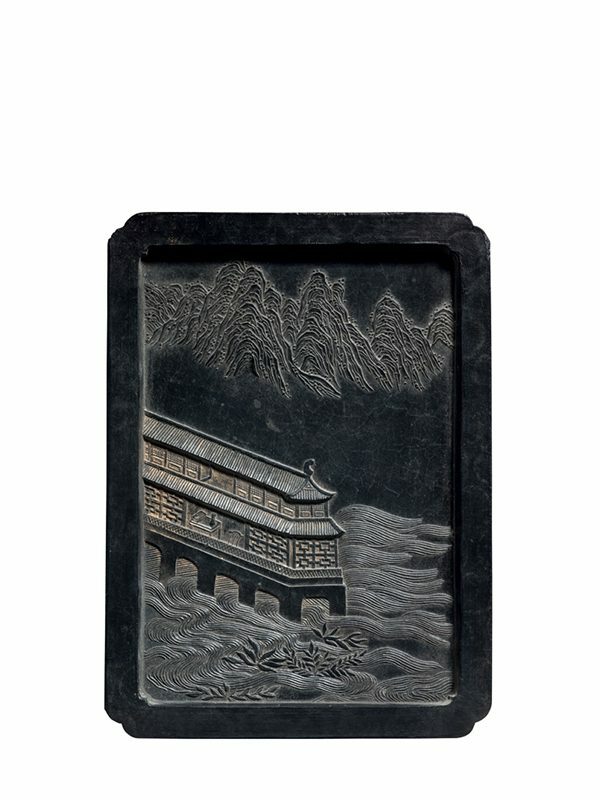 Craftsmen made Chinese ink from charcoal (burnt pine wood) mixed with oil and glue and pressed this mixture into finely carved moulds and then left it to dry. It set into a form of stick, cake or tablet with crisp decoration. The ink stick was then ground by hand on an ink stone and mixed with water to produce the solution of the desired density. Hu Kai Wen is one of the most famous ink stick manufacturer and his products were sold in a shop launched by Hu Tian Zhu (1742 – 1808) at Xiu Ning county (Xiu Cheng) at Huizhou. Their ink sticks were famous for fine quality and innovative design, and they were still active until the early 20th century. Two sets of ink sticks dated to the Jiaqing reign are in the collection of the Palace Museum, Beijing: both are inscribed with Hu Kai Wen’s mark, including a complete set of Yu Yan Tu ink sticks. An extremely rare rectangular ink tablet, similarly inscribed with Qianlong and Hu Kai Wen’s marks, is in the collection of the Palace Museum, Beijing.